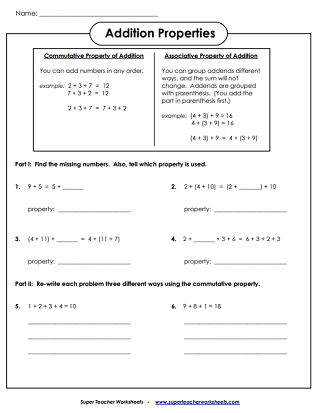 This page contains worksheets for teaching students about the identify (zero) property, commutative property, and associative property of addition. Practice recognizing and working with the properties of addition problems. This is a good introductory worksheet that contains only simple 1 and 2-digit numbers. This worksheet allows students to practice working with the properties of addition using only basic numbers. Assoc., Identity, & Comm. Props. 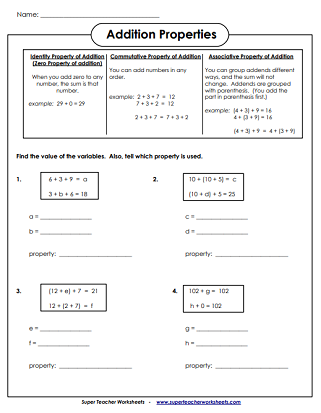 This worksheet includes the associative, commutative, and the identity (zero) properties. Students must write the value of each variable. There are three short-answer questions on this page for thinking about and discussing the properties of addition. This intermediate-level worksheet features larger numbers into the thousands and money amounts. Practice adding with 2, 3, and 4-digit numbers. 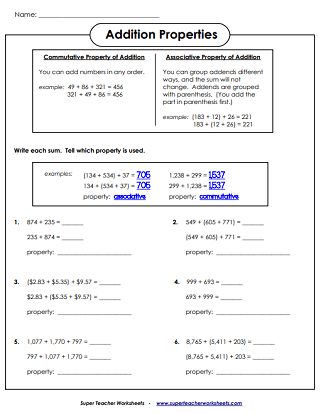 This page contains worksheets with basic, 1-digit adding facts. Add several 2, 3, and 4-digit numbers together by lining them up into columns.